^ a. The state's GDP was 259,676,342,000 pesos in 2009, amount corresponding to 20,287,214,218.80 dollars, being a dollar worth 12.80 pesos (value of June 3, 2010). Chihuahua (Spanish pronunciation: [tʃiˈwawa] ( listen)), officially the Free and Sovereign State of Chihuahua (Spanish: Estado Libre y Soberano de Chihuahua), is one of the 31 states of Mexico. It is located in Northwestern Mexico and is bordered by the states of Sonora to the west, Sinaloa to the southwest, Durango to the south, and Coahuila to the east. To the north and northeast, it has a long border with the U.S. adjacent to the U.S. states of New Mexico and Texas. Its capital city is Chihuahua City. Cliff dwellings at Las Jarillas Cave, part of the Cuarenta Casas archeological site. In 1562 Francisco de Ibarra headed a personal expedition in search of the mythical cities of Cibola and Quivira; he traveled through the present-day state of Chihuahua. Francisco de Ibarra is thought to have been the first European to see the ruins of Paquime. In 1564 Rodrigo de Río de Loza, a lieutenant under Francisco de Ibarra, stayed behind after the expedition and found gold at the foot of the mountains of the Sierra Madre Occidental; he founded the first Spanish city in the region, Santa Barbara in 1567 by bringing 400 European families to the settlement. A few years later in 1569 Franciscan missionaries led by Fray Agustín Rodríguez from the coast of Sinaloa and the state of Durango founded the first mission in the state in Valle de San Bartolomé (present-day Valle de Allende). Fray Agustín Rodríguez evangelized the native population until 1581. Between 1586 and 1588 an epidemic caused a temporary exodus of the small population in the territory of Nueva Vizcaya. El Templo de San Francisco in Chihuahua. The state seemed at relative calm compared to the rest of the country due to its close ties to the United States until 1841. In 1843 the possibility of war was anticipated by the state government and it began to reinforce the defense lines along the political boundary with Texas. Supplies of weapons were sent to fully equip the military and steps were taken to improve efficiency at the presidios. Later, the Regimen for the Defenders of the Border were organized by the state which were made up of: light cavalry, four squads of two brigades, and a small force of 14 men and 42 officials at the price of 160,603 pesos per year. During the beginning of the 1840s, private citizens took it upon themselves to stop the commercial caravans of supplies from the United States, but being so far away from the large suppliers in central Mexico the caravan was allowed to continue in March 1844. Continuing to anticipate a war, the state legislature on July 11, 1846 by decree enlisted 6,000 men to serve along the border; during that time Ángel Trías quickly rose to power by portraying zealous anti-American rhetoric. Trías took the opportunity to dedicate important state resources to gain economic concessions from the people and loans from many municipalities in preparation to defend the state; he used all the money he received to equip and organize a large volunteer militia. Ángel Trías took measures for state self-dependence in regards to state militia due to the diminishing financial support from the federal government. La Mesilla, a large area that was claimed by the state of Chihuahua. Museo Casa Juarez, a 19th-century building in downtown Chihuahua city, that served as the de facto National Palace of Mexico. Palacio de Alvarado is the house of Pedro Alvarado Torres, one of the richest silver barons of Mexico during the Porfiriato. The City Hall of Chihuahua is an example of the neoclassical architecture that was erected during the presidency of Porfirio Díaz. The Díaz administration made political decisions and took legal measures that allowed the elite throughout Mexico to concentrate the nation's wealth by favoring monopolies. During this time, two-fifths of the state's territory was divided among 17 rich families which owned practically all of the arable land in Chihuahua. The state economy grew at a rapid pace during the Porfiriato; the economy in Chihuahua was dominated by agriculture and mining. The Díaz administration helped Governor Luis Terrazas by funding the Municipal Public Library in Chihuahua City and passing a federal initiative for the construction of the railroad from Chihuahua City to Ciudad Júarez. By 1881, the Central Mexican Railroad was completed which connected Mexico City to Ciudad Juárez. In 1883 telephone lines were installed throughout the state, allowing communication between Chihuahua City and Aldama. By 1888 the telephone services were extended from the capital to the cities of Julimes, Meoqui, and Hidalgo del Parral; the telecommunication network in the state covered an estimated 3,500 kilometers. The need of laborers to construct the extensive infrastructure projects resulted in a significant Asian immigration, mostly from China. Asian immigrants soon become integral to the state economy by opening restaurants, small grocery stores, and hotels. By the end of the Terrazas term, the state experienced an increase in commerce, mining, and banking. When the banks were nationalized, Chihuahua became the most important banking state in Mexico. The government palace built during the early 20th century now a museum. Quinta Carolina is an hacienda owned by the Terrazas family. Generals Obregon, Villa and Pershing pose after meeting at Ft. Bliss, Texas (Immediately behind Gen. Pershing is his aide, 1st Lt. George S. Patton Jr.). Wintry landscape at Lake Arareco, in the Tarahumara Mountains. The state of Chihuahua is the largest state in the country and is known as El Estado Grande (The Big State); it accounts for 12.6% of the land of Mexico and slightly larger than the United Kingdom. The area is landlocked by the states of Sonora to the west, Sinaloa to the south-west, Durango to the south, and Coahuila to the east, and by the U.S. states of Texas to the northeast and New Mexico to the north. The state is made up of three geologic regions: Mountains, Plains-Valleys, and Desert, which occur in large bands from west to east. Because of the different geologic regions there are contrasting climates and ecosystems. The main mountain range in the state is the Sierra Madre Occidental reaching a maximum altitude of 10,826 ft (3,300 m) known as Cerro Mohinora. Mountains account for one third of the state's surface area which include large coniferous forests. The climate in the mountainous regions varies. Chihuahua has more forests than any other state in Mexico making the area a bountiful source of wood; the mountainous areas are rich in minerals important to Mexico's mining industry. Precipitation and temperature in the mountainous areas depends on the elevation. Between the months of November and March snow storms are possible in the lower elevations and are frequent in the higher elevations. There are several watersheds located in the Sierra Madre Occidental all of the water that flows through the state; most of the rivers finally empty into the Río Grande. Temperatures in some canyons in the state reach over 100 °F (38 °C) in the summer while the same areas rarely drop below 32 °F (0 °C) in the winter. Microclimates found in the heart of the Sierra Madre Occidental in the state could be considered tropical, and wild tropical plants have been found in some canyons. La Barranca del Cobre, or Copper Canyon, a spectacular canyon system larger and deeper than the Grand Canyon; the canyon also contains Mexico's two tallest waterfalls: Basaseachic Falls and Piedra Volada. There are two national parks found in the mountainous area of the state: Cumbres de Majalca National Park and Basaseachic Falls National Park. Satellite image of the state of Chihuahua shows the varying terrain from the green alpine mountains in the southwest, to the steppe highlands in the center, to the desert in the east. Basaseachic Falls in Copper Canyon. Namúrachi is in the semi-arid zone. Altiplanicie Mexicana during the monsoon season. Chihuahua white pines amid snow. Dunas de Samalayuca a state protected area south of Ciudad Juárez. Cumbres de Majalca National Park is found in the transition zone from humid subtropical climate to semiarid climate where Pinus ponderosa can be found. American bison Bison bison near Chihuahua City. The Chihuahuan Desert is home to a diverse ecosystem which is home to a large variety of mammals. The most common mammals in the desert include: Desert cottontail Sylvilagus audubonii, black-tailed jackrabbit Lepus californicus, hooded skunk Mephitis macroura, cactus mouse Peromyscus eremicus, swift fox Vulpes velox, white-throated woodrat Neotoma albigula, pallid bat Antrozous pallidus, and coyote Canis latrans. The most observed reptiles in the desert include: Mohave rattlesnake Crotalus scutulatus, twin-spotted rattlesnake Crotalus pricei, prairie rattlesnake Crotalus viridis, ridge-nosed rattlesnake Crotalus willardi, whip snake Masticophis flagellum, New Mexico whiptail Aspidoscelis neomexicanus, and red-spotted toad Bufo punctatus. Tarahumara women selling artisanal goods. Plautdietsch speaking Mennonite girl in Cuauhtémoc, Chihuahua. During the Mexican Revolution, Álvaro Obregón invited a group of Canadian German-speaking Mennonites to resettle in Mexico. By the late 1920s, some 7,000 had immigrated to Chihuahua State and Durango State, almost all from Canada, only a few from the U.S. and Russia. Today, Mexico accounts for about 42% of all Mennonites in Latin America. They are a largely insular community that speaks a form of German and wear traditional clothing. They own their own businesses in various communities in Chihuahua, and account for about half of the state's farm economy, excelling in cheese production. A panoramic view of Ciudad Juárez and El Paso, Texas from the north. The Hueco Mountains can be seen toward the east; the Juarez mountains of Mexico can be seen to the south (right of the image). Quinta Gameros was built in 1907 as a private residence and is now part of the Universidad Autónoma de Chihuahua Campus. Copachisa is an industrial design and construction company based in the city of Chihuahua, Mexico. The state has the 12th-largest state economy in Mexico, accounting for 2.7% of the country’s GDP. Chihuahua has the fifth highest manufacturing GDP in Mexico and ranks second for the most factories funded by foreign investment in the country. As of 2011[update], the state had an estimated 396 billion pesos (31.1 billion dollars) of annual GDP. According to official federal statistical studies, the service sector accounted for the largest portion of the state economy at 59.28%; the manufacturing and industrial sector is estimated to account for 34.36% of the state's GDP, with the agricultural sector accounting for 6.36% of the state's GDP. Manufacturing sector was the principal foreign investment in the state followed by the mining sector. In 2011, the state received approximately 884 million dollars in remittances from the United States, which was 4.5% of all remittances from the United States to Mexico. Naica Mine is known for its extraordinary selenite crystals and is a major source of lead, zinc, and silver operated by Industrias Peñoles. The dairy industry is an important part of the agriculture sector of the economy in the state. As of 2007[update], the state's economy employed 786,758 people, which accounted for 3.9% of the country's workforce with annual GDP per capita of 136,417 pesos (12,338 dollars). The average employee wage in Chihuahua is approximately 193 pesos per day. The minimum wage in the state is 61.38 pesos (4.66 dollars) per day except for the municipalities of Guadalupe, Ciudad Juárez, and Praxedis G. Guerrero, which have a minimum wage of 64.76 Mexican pesos (4.92 dollars). Agriculture is a relatively small component of the state's economy and varies greatly due to the varying climate across the state. The state ranked first in Mexico for the production of the following crops: oats, chile verde, cotton, apples, pecans, and quince. The state has an important dairy industry with large milk processors throughout the state. Delicias is home to Alpura, the second-largest dairy company in Mexico. The state has a large logging industry ranking second in oak and third in pine in Mexico. The mining industry is a small but continues to produce large amounts of minerals. The state ranked first place in the country for the production of lead with 53,169 metric tons. Chihuahua ranked second in Mexico for zinc at 150,211 metric tons, silver at 580,271 kg, and gold at 15,221.8 kg. Wikimedia Commons has media related to Chihuahua (state). ^ "Las Diputaciones Provinciales" (PDF) (in Spanish). p. 15. Archived (PDF) from the original on June 7, 2011. ^ "Senadores por Chihuahua LXII Legislatura". Senado de la Republica. Archived from the original on July 13, 2014. Retrieved August 14, 2014. ^ "Listado de Diputados por Grupo Parlamentario del Estado de Chihuahua". Camara de Diputados. Archived from the original on March 22, 2010. Retrieved October 4, 2010. ^ "Relieve". Cuentame INEGI. Archived from the original on November 7, 2010. Retrieved October 20, 2010. ^ "Mexico en Cifras". INEGI. Archived from the original on December 1, 2011. Retrieved April 9, 2011. ^ "Prevencion de Incendios Forestales en Chihuahua". Eduteka. Archived from the original on December 1, 2011. Retrieved April 13, 2010. ^ "Mapa del Area de Barrancas". ViajesBarrancasDelCobre.com. Archived from the original on March 28, 2010. Retrieved April 13, 2010. ^ "Mapa del Area de Barrancas". Coopper Canyon Insider. Archived from the original on January 5, 2010. Retrieved April 13, 2010. ^ "Resumen". Cuentame INEGI. Archived from the original on January 30, 2010. Retrieved October 4, 2010. ^ Christopher Scarre (2013). The Human Past: World Prehistory & the Development of Human Societies. Thames & Hudson. ISBN 978-0-500-29063-7. ^ Fowler, Will (2006). Political Violence and the Construction of National Identity in Latin America. Gordonsville, Virginia, USA: Palgrave Macmillan. ISBN 978-1-4039-7388-7. ^ a b c Vazquez-Gomez, Juana (1997). Dictionary of Mexican Rulers, 1325–1997. Westport, Connecticut, USA: Greenwood Publishing Group, Incorporated. ISBN 978-0-313-30049-3. ^ a b c Sosa, Francisco (1985). 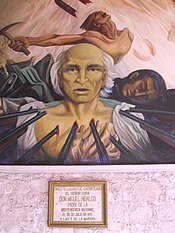 Biografias de Mexicanos Distinguidos-Miguel Hidalgo (in Spanish). 472. Mexico City: Editorial Porrua SA. pp. 288–292. ISBN 968-452-050-6. ^ Villalpando, Jose Manuel (December 4, 2002). "Mitos del Padre de la Patria. (Cultura)" (in Spanish). Mexico City: La Reforma. p. 4. ^ a b c Van Young, Eric (2001). Other Rebellion : Popular Violence and Ideology in Mexico, 1810–1821. Palo Alto, California, USA: Stanford University Press. ISBN 978-0-8047-3740-1. ^ a b c "Quien fue Hidalgo? - Biografia" (in Spanish). Mexico: INAH. Archived from the original on December 17, 2007. Retrieved November 27, 2007. ^ a b Vidali, Carlos (December 4, 2008). "Fusilamiento Miguel Hidalgo" (in Spanish). San Antonio: La Prensa de San Antonio. p. 1. ^ a b Vanden, Harry E. (2001). Politics of Latin America : The Power Game. Cary, North Carolina, USA: Oxford University Press. ISBN 978-0-19-512317-3. ^ a b Benjamin, Thomas (2000). Revolución : Mexico's Great Revolution as Memory, Myth, and History. Austin, Texas, USA: University of Texas Press. ISBN 978-0-292-70880-8. ^ "Siqueiros & the Hero Priest". Time. Time/CNN. May 18, 1953. Archived from the original on December 22, 2008. ^ Ben Cahoon. "Mexican States A-J". worldstatesmen.org. Archived from the original on January 22, 2011. Retrieved January 15, 2011. ^ "Seminole in Mexico". Oklahoma: Seminole Nation, I. T. Archived from the original on July 26, 2011. Retrieved January 15, 2011. ^ Riva Palacios, Vicente (1940). Revolución : México á través de los siglos: historia general y completa del desenvolvimiento social, político, religioso, militar, artístico, científico y literario de México desde a antigüedad más remota hasta la época actual. California. México. : University of California Libraries (G. S. López edición). México. nrlf_ucd:DVXL-000648908. ^ "Instituto Nacional de Estadística y Geografía (INEGI) - 'Archivo Histórico de Localidades'" (in Spanish). October 19, 2010. Archived from the original on 2010-10-19. ^ "French intervention and the Second Mexican Empire 1864–1867". MexicanHistory.org: MexicanHistory.org. Archived from the original on July 27, 2011. Retrieved January 16, 2011. ^ Skidmore, Thomas; Peter H. Smith (1989). Modern Latin America. Oxford, UK: Oxford University Press. ISBN 0-19-505534-9. 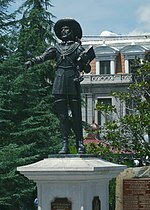 ^ "Porfirio Díaz". The New Encyclopædia Britannica 15th Edition. 1993. p. 70. ^ Crow, John A. (1992). The Epic of Latin America. Berkeley, CA: University of California Press. p. 673. ISBN 0-520-07723-7. ^ Clayton, Lawrence A.; Conniff, Michael L. (2005). A History of Modern Latin America. United States: Wadsworth Publishing. pp. 285–286. ISBN 0-534-62158-9. ^ McLynn, Frank. Villa and Zapata p. 24. ^ Womack, John. Zapata and the Mexican Revolution p. 10. ^ Johnson, William. Heroic Mexico p. 41. ^ a b Pascual Orozco : Faces of the Revolution : The Storm That Swept Mexico : PBS Archived September 24, 2015, at the Wayback Machine. ^ Carothers to Secretary of State, April 22, 1914, Wilson Papers, Ser. 2, as quoted in P. Edward Haley (1970). Revolution and Intervention: The Diplomacy of Taft and Wilson with Mexico, 1910-1917. M.I.T. Press. p. 135. ISBN 978-0-262-08039-2. ^ Heribert von Feilitzsch, In Plain Sight: Felix A. Sommerfeld, Spymaster in Mexico, 1908 to 1914, Henselstone Verlag, Virginia, 2012, p. 359. ^ a b c d e "Who Was Venustiano Carranza, Revolutionary President of Mexico?". about.com. Archived from the original on February 3, 2017. Retrieved April 27, 2018. ^ Correspondents (February 6, 2010). "Trasladan Poderes de Chihuahua a Juárez". El Universal (in Spanish). Archived from the original on February 9, 2010. Retrieved February 7, 2010. ^ Correspondents (February 12, 2010). "Diputados dicen no al traslado de Poderes". El Universal (in Spanish). Archived from the original on February 15, 2010. Retrieved February 12, 2010. ^ "LA FLORA DE LAS BARRANCAS DEL COBRE, CHIHUAHUA, MÉXICO" (in Spanish). Archived from the original on December 1, 2011. Retrieved January 17, 2010. ^ "Chihuahua Desert Ecoregion". Terrestrial Ecoregions. World Wildlife Fund. ^ "Encuesta Intercensal 2015" (PDF) (in Spanish). INEGI. Archived from the original (PDF) on December 10, 2015. Retrieved December 8, 2015. ^ "Publicaciones y productos". www.inegi.org.mx. Archived from the original on March 3, 2016. Retrieved April 27, 2018. ^ "ESSAYS AND RESEARCH ON". www.somosprimos.com. Archived from the original on June 22, 2016. Retrieved April 27, 2018. ^ Harry Leonard Sawatzky: Sie suchten eine Heimat - deutsch-mennonitische Kolonisierung in Mexico 1922-1984, Marburg 1986, p. 68. ^ "Ciudad Juarez passes 2,000 homicides in '09, setting record". chron.com. Archived from the original on April 28, 2011. Retrieved April 27, 2018. ^ "Conteo de Población y Vivienda 2005". Instituto Nacional de Estadística y Geografía. INEG. Retrieved 15 August 2010. Select Estado (State), then Descargar (Download). ^ a b c "INEGI" (in Spanish). October 11, 2016. Archived from the original on 2016-10-11. ^ Secretaria de Economía Chihuahua 2013. SECRETARÍA DE ECONOMÍA. 2013. ^ Sistema de Cuentas Nacionales de México 2005-2009. Mexico City: INEGI. 2009. p. 34. ^ "Banco de Información Económica". Sistemas Nacionales Estadístico y de Información Geográfica. Archived from the original on January 28, 2016. Retrieved March 18, 2008. ^ "Tablas, Tasas, Tarifas e Indicadores Fiscales: Salarios Mínimos 2012". Sat.gob.mx. Archived from the original on October 29, 2012. Retrieved October 28, 2012.